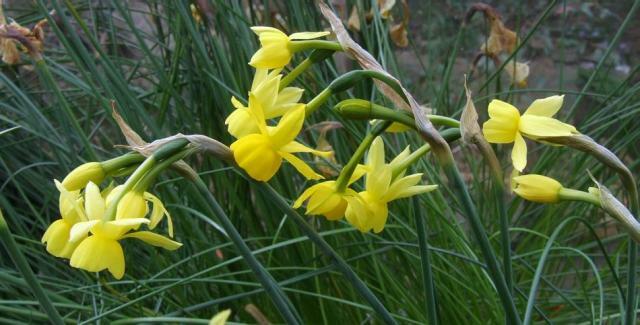 Hybrid Narcissus and many cultivars are pictured on this wiki page. 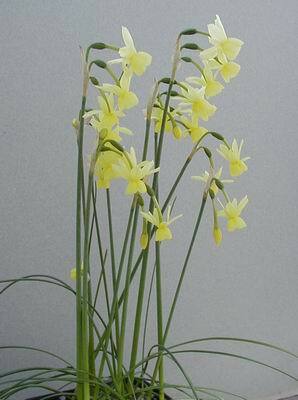 Narcissus bulbocodium hybrids These hybrids result from crosses of Narcissus romieuxii and N. bulbocodium var. mesatlanticus which are both very charming, most welcome and popular late winter, early spring flowering species. Eventually I will select yet to be named cultivars that produces good hybrid vigour, with larger, well-formed flowers, preferably producing two, three, or even four blooms on short stong stems, in various attractive shapes and sizes, to the wide open, with flaring, almost trumpet hoops, to frilled petuniod margins, in various beautiful shades of lemon to deep gold. After selection, I have often crossed again with other hybrids with equally desirable characteristics to further improve reliability, good looks and quality. Pictures of some of my final selections are on this page. These plants are ideal for pot culture and the rock garden. Photographed and grown by Bill Dijk. 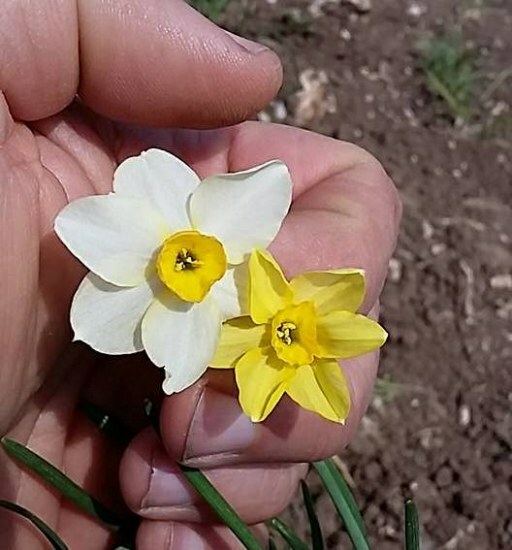 Narcissus cantabricus ssp. cantabricus var. 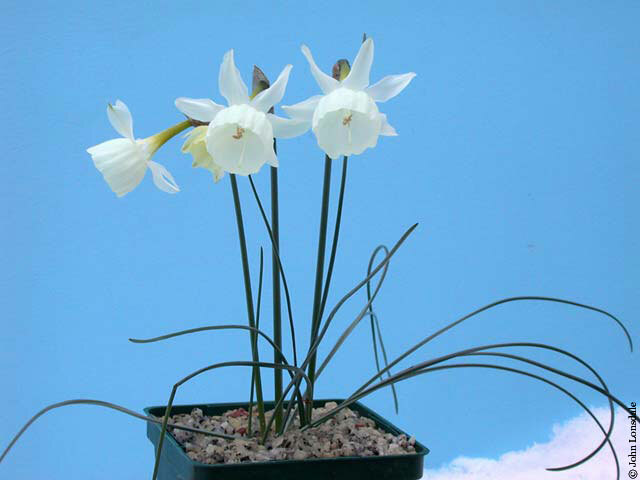 petunioides × Narcissus triandrus Photo by John Lonsdale. 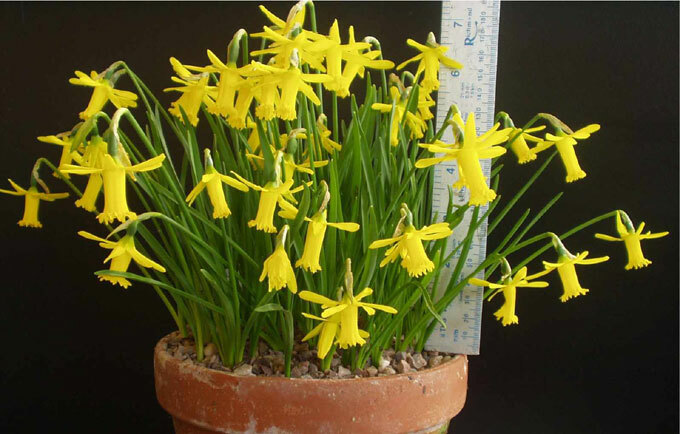 Narcissus cyclamineus × Narcissus asturiensis bred and photographed by Anne Wright, York, England. Strong grower, easy to twin-scale. 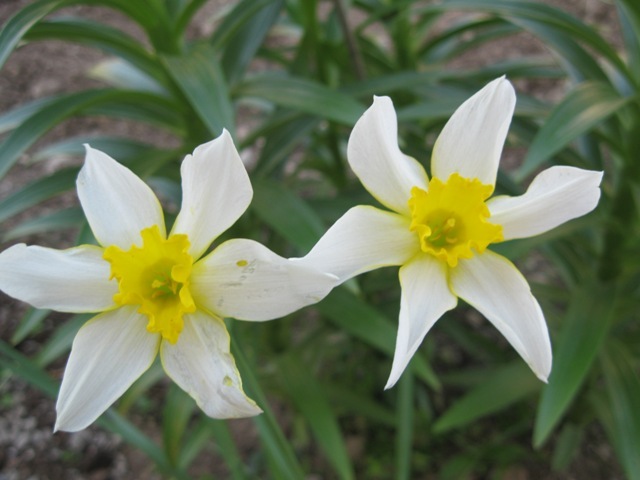 Narcissus × incomparabilis , is a natural sterile hybrid between Narcissus pseudonarcissus and Narcissus poeticus. The specific Latin name incomparabilis which translates to "matchless" was given early before the binomial nomenclature was introduced by Linnaeus and it refered to the large size of the flower, at that time, compared with both the wild parents. Today we would consider it a medium or even a small flowered hybrid. 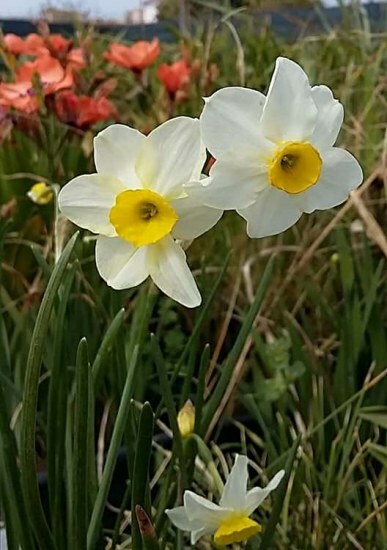 Giovanni Battista Ferrari in his 'Flora' published in 1635 described several forms of Narcissus x incomparabilis being in cultivation in Italy at that time, even some double forms. It is intermediate-late flowering and slightly scented. Photo by Angelo Porcelli of the strain found wild in Central Italy. Narcissus × incurvicervicus (syn. 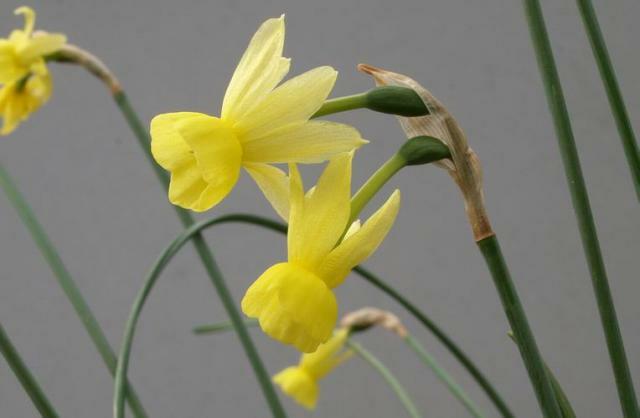 Narcissus x ubriquense) is a naturally occurring intersectional sterile hybrid between N. fernandesii and N. triandrus subsp. pallidulus. Spain. Photos by Ian Young, who reports it increases well for him. 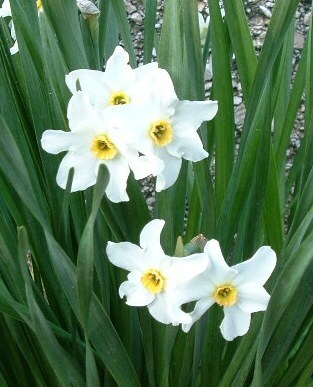 Narcissus × medioluteus , syn. 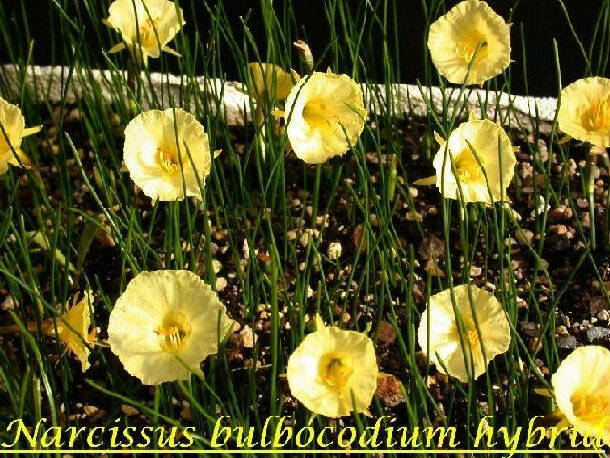 Narcissus × biflorus is a natural sterile hybrid between Narcissus poeticus and Narcissus tazetta which bears usually 2 but in cultivation often 3-4 flowers per stalk. Artificial hybrids between these species are popular, known as Poetaz. It is late flowering. Photo by Angelo Porcelli. 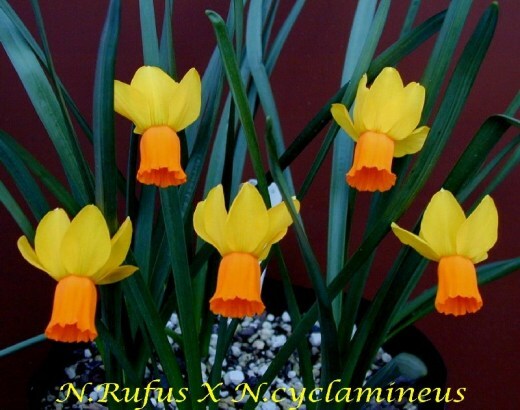 Narcissus rufus × Narcissus cyclamineus crossed and photographed by Bill Dijk in New Zealand. Narcissus tazetta ssp. 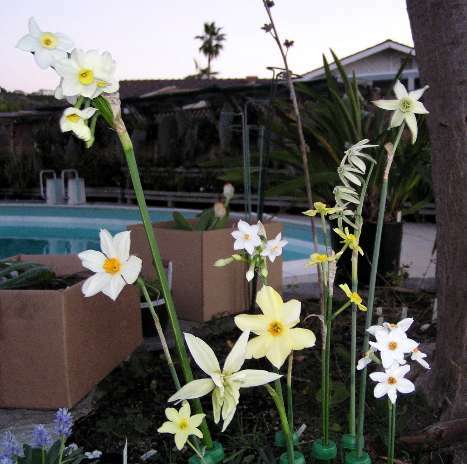 italicus is actually a sterile hybrid between Narcissus tazetta and Narcissus papyraceus found occasionally in Italy where the two species overlap. 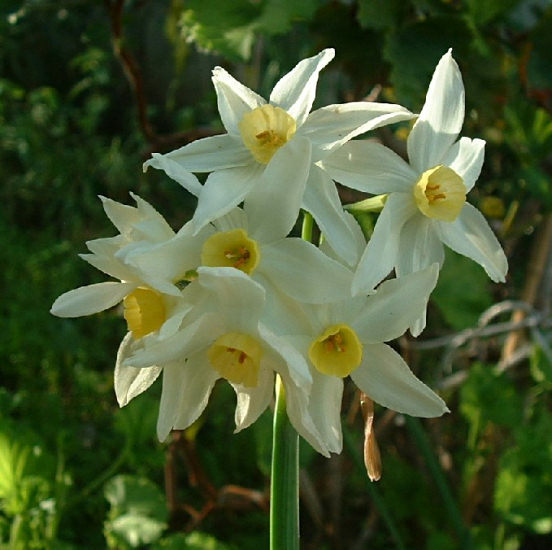 Note that Narcissus papyraceus probably isn't a true Italian native, but was introduced long ago and naturalized, especially along the coasts. William Welch reports this hybrid has been also named 'Stars' and 'Straw White', while Scott Ogden adds 'Minor Monarch' in his book. Photo by Angelo Porcelli. Narcissus various autumn-blooming hybrids - grown by Harold Koopowitz. Photo taken November 2003 by Lee Poulsen.